FAB FORUM: What do I wear to a Superbowl party? It’s Super Bowl Weekend, and the FabGirls are excited! There will be tons of parties to attend and we want you ladies to be cute and represent the team that you’re rooting for. Casual is the way to go for a Super Bowl Party. 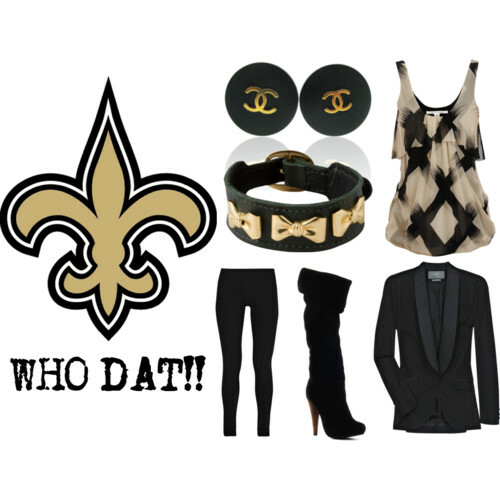 For all you Saints fans, we put together a Kim Kardashian (girlfriend of Saints player Reggie Bush) inspired outfit. We combined the team colors, and mixed with Kim’s style. Check it out! For all of you die-hard Colts fans, this little outfit is for you! Check out the sporty little Chuck Taylors. We’re not even Colts fans, but we’d wear this! Remember to be safe this Super Bowl weekend!